Monster Energy’s motorsports marketing machine is at it again. Say hello to Battledrift 2 – five minutes of tire-smoking YouTube goodness that frankly would be just another over-edited drift video if it wasn’t for the appearance of a Lamborghini Murcielago. It’s not everyday you see a V12 supercar engaged in opposite-lock tomfoolery while in very close proximity to obstacles, and in this case, a similarly sideways Nissan GT-R. Obviously this isn’t just another pair of horsepower junkies with more money than talent. 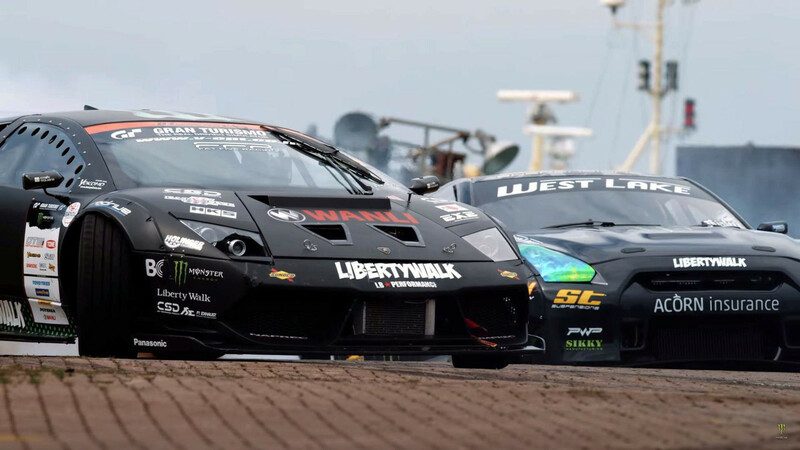 The Murcielago in this video is driven by Daigo Saito, a drifting pro from Japan who competes in the D1 Grand Prix. As the video clearly shows, the Lambo isn’t just fitted with Monster decals and green wheels – it’s a full-on drift-spec machine purpose-built to go sideways, and that’s not easily done with a portly mid-engined Italian supercar. The Nissan GT-R is a bit more familiar in the drifting world, and this one is handled by 2009 British Drift Champion Steve Biagioni. Like the Lambo, this car is also drift-spec but the whistling turbos suggest the Nissan has a tad more horsepower. We’re told the number is actually 1,400, which is certainly enough to annihilate the tires in just about any gear. And to make things a bit more lively, we get a stadium truck thrown in to jump over things, including the dueling drifters. Nice. This video was a collaboration with Donut Brand Studio and directed by Andrew Laputka, and while it's certainly entertaining the constant jump-cuts border on seizure-inducing. We know Monster is all about fast-paced action in videos like this but holy cow – watching this video just once requires at least a couple aspirin. Watch it again and you could unwittingly trigger your secret CIA assassin protocol. Don't blame us if you wake up tomorrow in the woods with a Glock, pop tarts, and a bloody towel. Still, we have a Lamborghini singing V12 soprano in opposite-lock action with a whistling Nissan GT-R. It’s not our worst Thursday afternoon.